1// Covergirl LashBlast mascara. Personally, my favorite varieties of this line are the volume (shown), fusion, and clump crusher. 2//Neutrogena Clear Face Sunscreen. You should always, always wear a facial sunscreen even if your makeup contains sunscreen. It's so important to protect your skin to prevent sun damage! I love this facial sunscreen because it's SPF 55 which is the highest I've found so far (for the face), it's designed to not cause breakouts (so important for my acne-prone skin), and it doesn't break the bank. Plus you only use a small amount so it lasts a really long time! 3// Maybelline Fit Me Shine-Free Foundation. I was actually surprised that the description of this product says "foundation" because I'm pretty sure it's designed to be used as more of a concealer (which is what I use it for). This product is amazing, I'm not kidding you. It gives amazing coverage but is so lightweight that you feel like you're wearing nothing at all! This is my new forever concealer. 4// eos lip balm. I think I might be the last person ever to try this stuff? I bought it a few weeks ago after rave reviews from my little sister and oh my goodness! it's the best chapstick/lip balm/etc that I've ever used! And it's priced at less than $3! It's not oily, it smells great, and it keeps your lips moisturized for a long time. I'm a big fan of Burt's Bees chapstick but I think this is my new go-to. 5// Maybelline Dream Liquid Mousse Foundation. Let me just say, Maybelline is getting it right in the face makeup department lately. I used Bare Minerals loose powder foundation for years and recently decided I wanted to switch. The Bare Minerals just wasn't doing it for me anymore - It wasn't providing the coverage I needed while pregnant and having hormonal breakouts and I was having to reapply several times a day to keep my makeup looking fresh. After a mad hunt and several purchased/returned foundations I found this beauty. It's light but provides great coverage and it stays put all day (I don't use a face primer). My skin tone looks so even after applying this and it really does have the airbrush finish that the bottle claims. I'll definitely be buying this again when it runs out! 6// Neutrogena Oil-Free Acne Stress Control Power Cream Wash. Wow. That's a long name. This is an excellent product! Like I said, my face is acne-prone so finding a face wash that keeps the blemishes away is imperative. I started using this while I was pregnant and noticed a dramatic difference in my skin almost immediately. I've continued to use it post-pregnancy and my skin is generally completely clear these days (partially due to the fact that I'm not pregnant anymore but I also think this face wash is contributing to keeping those pimples away!). 7// Revlon Photo Ready 3D Volume Mascara. Generally, I'll apply the CoverGirl LashBlast mascara first and then top it with this one before my first coat dries. I am in love with this mascara! I think it's a pretty good dupe of Benefit's They're Real! mascara. The brush is really stiff with plastic bristles which is my favorite. It grabs all your lashes and leaves no clumps. If I had to use just one mascara (instead of doubling up like I normally do), it would be this one. hint: when using two different mascaras try using ones with different purposes for the best results. Example: a volume mascara with a lengthening mascara. 8// e.l.f. healthy glow bronzing powder in sun kissed. It works great and it's $1. Enough said. 9// Sally Hansen X-treme Wear Nail Color in Mint Sorbet. This line of Sally Hansen nail polish is under $3 and, for that price point, it's pretty fantastic. It dries really fast (which is so important when you have babies who might need you at any minute), it has great coverage in the first coat (even though I still generally do two coats just for good measure), and it lasts a week without chipping! I used to think all nail polish was created equal and always bought the NYC nail polish that was under a dollar. I had a million colors but the polish always chipped in the first day. I've since learned that more expensive nail polish really is better quality. I still can't seem to fork over $8-$15 for one color though! I've been in heaven since discovering this Sally Hansen line. At $3 a bottle, I can have multiple colors and not worry about any chipping for days! - and I am not easy on my nails, friends. 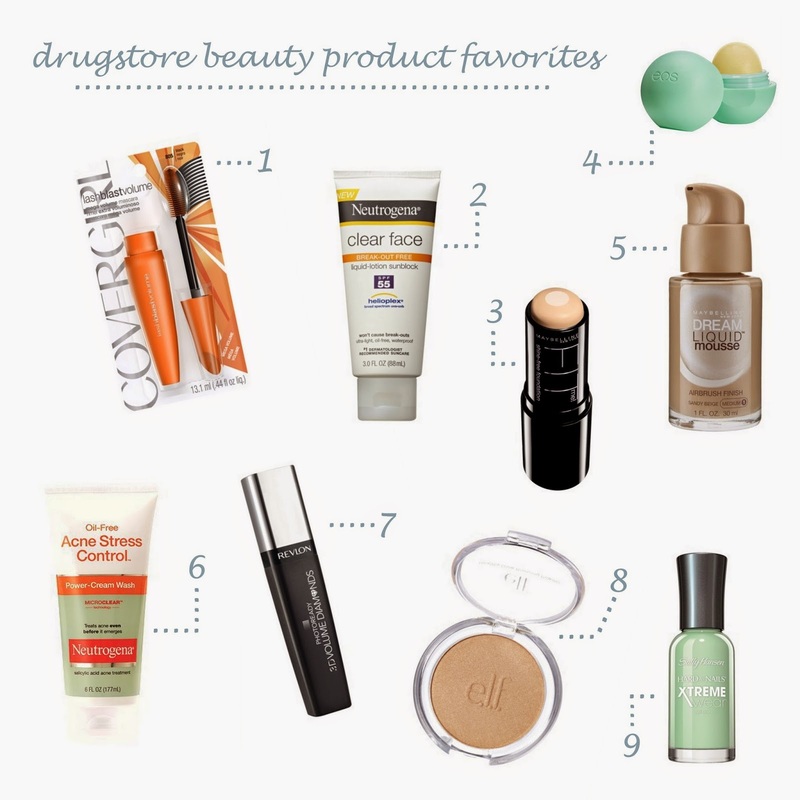 I hope this drugstore product round-up was helpful for you! If you're new here don't forget to follow along with Bloglovin'! PS does anybody have a favorite drugstore blush or lipstick I should try? PS2 I'm in Utah right now on a surprise visit to my sibs! Blog posts might be few and far between for the next few days but follow along on insta to see what we're up to here in the Beehive state (and Jack Jack's hometown!). I love seeing what other drugstore products people are loving! That nail polish looks like such a gorgeous color & you can't beat the price! The nail polish really is amazing! I love seeing what other people are loving from drugstores too - then I don't have to spend hours trying to figure out which new product to try haha! I also love seeing other peoples drugstore finds - I don't like to spend a lot, so I'm all about the cheap stuff. I pretty much love anything Maybelline, and I freaking adore Revlon's mascara. Haven't tried that one yet though, thanks for sharing! I'm with you! 95% of my makeup products are drugstore products! The Revlon mascara is amazing - try it! I've heard mixed reviews about the EOS balm---some say that it's really drying, but there are also beauty editors who swear by it. I personally would just buy it for the shape and the cute colors. Really!? I love the stuff! It's so cheap too, it's worth a try! And the cute packaging is definitely a plus ha!